Most innovations in the world are concentrated in a few developed nations. Developing countries are mainly adopters, as opposed to innovators, because it is easier for them to use foreign technologies than to invent the technology themselves.1 China is one example, having acted consistently as an adopter of technologies due to its reliance on foreign innovations. Santacreu and Peake (2019) document that China's payments for the use of foreign intellectual property—that is, royalty payments from China to the world—have increased substantially over time, from a little more than $1 billion in 1999 to more than $27 billion in 2017.2 These data also may suggest that China is improving its enforcement of intellectual property rights. Over the past 10 years, we observe not only an increase in China's royalty payments, but also a significant increase in the pace at which the world is paying China for the use of Chinese intellectual property. Moreover, we observe a significant increase in China's innovation efforts. In this essay, we analyze how these findings suggest the following: (i) China, traditionally an adopter of foreign technology, is catching up to the United States in its innovation efforts; and (ii) Chinese innovations are diffusing rapidly throughout the world. Second, we use data on the world's royalty payments to China and the U.S. for the use of intellectual property5: These data serve as an indication of knowledge diffusion for the two countries.6 We find that China still lags behind the U.S. For example, in 2016, the U.S. received $113 billion in royalties from the world, whereas China received only slightly more than $1 billion. This is not surprising, as the U.S. is one of the global leaders in innovation. However, the world's royalty payments to China have increased significantly in recent years, from $450 million in 2007 to more than $1 billion in 2016. Figure 1B plots the total intellectual property payments from the world to China as a percentage of the total intellectual property payments from the world to the U.S. In 2007, China's royalty payments from the world were 0.44 percent of those in the U.S. By 2016, they were just over 1 percent. Indeed, China has seen an almost 160 percent increase in intellectual property receipts from the world in the past decade, compared with an 11 percent increase for the U.S. over the same time frame, which indicates China's increased knowledge diffusion throughout the world. 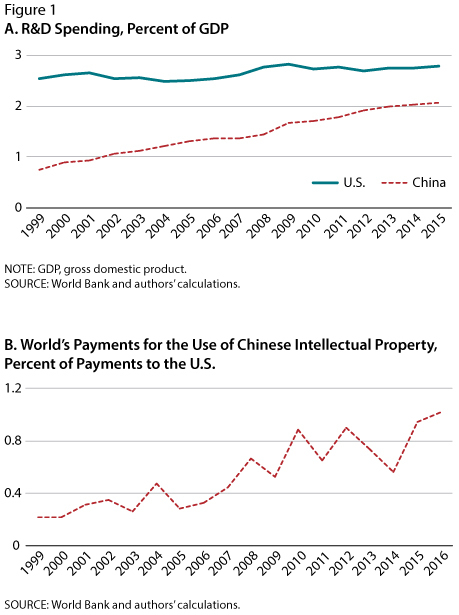 Data on R&D intensity coupled with data on payments for the use of Chinese intellectual property indicate that China is moving toward global leadership in innovation. Not only are China's technologies increasingly used by other countries, but China is developing technologies at a rapid rate. Although it still has a long way to go to become an innovation leader, China is moving toward the role of global innovator and away from its traditional role as mainly an adopter of innovation. 1 Santacreu, Ana Maria and Zhu, Heting. "Domestic Innovation and International Technology Diffusion as Sources of Comparative Advantage." Federal Reserve Bank of St. Louis Review, Early Edition 2018. 2 Santacreu, Ana Maria and Peake, Makenzie. "A Closer Look at China's Supposed Misappropriation of U.S. Intellectual Property." Federal Reserve Bank of St. Louis Economic Synopses, February 8, 2019. 3 Data are from the World Bank's World Development Indicators (WDI) database. 4 Davis, Bob and Wei, Lingling. "China's Plan for Tech Dominance Is Advancing, Business Groups Say." Wall Street Journal, January 2018. 5 Data are from the World Bank's World Development Indicators (WDI) database. 6 It is important to note that R&D data are considered flow variables because they measure innovation over a period of time, while royalty payments are considered stock variables because they capture payments for the use of current and past innovations at specific points in time.